Labrador retrievers are great dogs, don’t you think? You may be wondering why I am talking about Labrador retrievers when I am displaying a picture of mittens. I know it sounds kooky, but there is a connection between Labs and those mittens in the picture. My younger sister has a chocolate Lab named Cocoa. He is a beautiful dog and as sweet as can be. Had I a picture of him, I would have used it. But, alas, I don’t have a single photograph of Cocoa. Cocoa’s huge, as chocolate Labs tend to be, but he is a very well behaved fellow. He is a purebred Lab and was found abused, abandoned, sick, and starving. It is hard to believe that anyone would ever abandon such a gorgeous dog, but our canine companions are nobler creatures than we humans, in my opinion. My sister and her college-aged kids took Cocoa in and nursed him back to health. They paid the vet bills, treated him for heartworm and other parasites, gave him antibiotics for his infections, and fed him a special diet that required daily preparations. And they gave him lots of love, attention, patience, kindness, and care. Cocoa has been with them for a year-and-a-half now and is a very happy and healthy dog. He still has a few “issues,” primarily separation anxiety, but his mental health, like his physical health, is greatly improved. I think my sister and her kids are happier for having Cocoa in their lives, too. This is all well and good, you are saying. But what does this have to do with knitting? After all, you say, at the beginning of this entry, you claim that it’s about knitting, so where’s the wool? Well, a knitting blog this is, and what follows is Cocoa’s connection to my knitting. A couple of years ago I knitted my niece a pair of mittens. Now, these were no ordinary mittens. 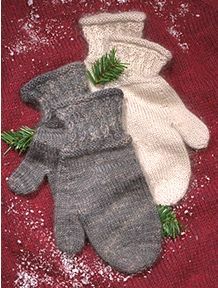 They were Magical Mittens knitted from K1C2 Richesse et Soie and K1C2 Douceur et Soie in a lovely pale gray. For those of you not in the know, Richesse et Soie is a blend of cashmere and silk and a very pricey yarn. Mittens from Richesse et Soie are affordable. A shawl, not so much. A sweater–forget about it. Douceur et Soie is a lace weight yarn made of fuzzy mohair and silk. The mohair yarn is just along for the ride in these mittens. The cashmere is the real star. My niece was wild about these mittens. She wore them all the time and claims they are the warmest mittens she has ever had. I suppose you know where I’m going with this story. You’re right. Cocoa ate one of the mittens. No problem, I tell my niece. I’m sure I can get more Richesse et Soie and make another mitten to replace the one Cocoa destroyed. Oh, boy, was that ever a mistake. You would think an experienced knitter like me would know better than to tempt the knitting gods with absolute certainty. Such arrogance shall not go unpunished. Nothing will cause a yarn to be discontinued and to disappear from every yarn store on the Internet faster than smugness. I apologized to my niece for making a promise I cannot keep.